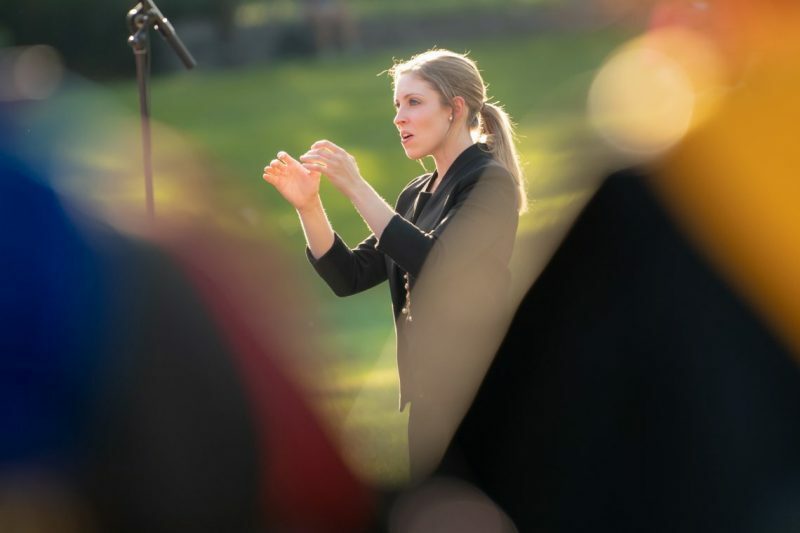 A W&L Experience, Reprised Morgan Luttig '14, who studied vocal performance and education at W&L, has returned as visiting instructor of music while Professor Shane Lynch is on sabbatical. What have you been up to since you graduated from W&L in 2014? After graduating from W&L I moved to Savannah, Georgia, where I taught pre-K through 12th grade music at St. Andrew’s School. In that position I was the choral director for 3rd through 12th grade choral ensembles, and I also taught general music for 3-year olds, kindergarten, and 2nd grade. I also acted as music director for the lower school and upper school musicals, and led a cross-divisional a cappella group at the school. Outside of teaching I sang with the Savannah Philharmonic Chorus, iCantori Vocal Ensemble and a church choir. While in Savannah I had the opportunity to be a conducting fellow with the Savannah Children’s Choir, and Assistant Artistic Director for RISE Chorales, a new young women’s chorale in Savannah. During my third year of teaching, I began my master’s degree work at Westminster Choir College in Princeton, New Jersey. I completed my degree in Princeton the following academic year. I went to school for a master of music education – choral emphasis degree and was a music education graduate assistant, teaching 6th grade general music at the local middle school. While doing my master’s work, I made sure to continue my work with children’s choirs, acting as a conducting fellow for the Princeton Girlchoir and Princeton Boychoir and Associate Conductor for the Westminster Neighborhood Children’s Choir. It has been a busy few years! What made you decide to embark on a career in vocal music? I actually decided to pursue choral music as a career when my family moved to Lake Forest, Illinois, right before I started high school. Previously we were located in Virginia, and I was determined to enter the journalism program in my local high school. However, my new school did not have a journalism program, so instead I elected to be in choir. I’ve been in choirs for as long as I can remember, but it was in those high school ensembles that I truly fell in love with ensemble singing. I’ve been fortunate to have amazing conducting opportunities in high school and beyond. I’ve found unbelievable power in choral music, not only for those who are singing, but also for audiences. In my opinion, there is nothing quite as authentic and meaningful as humans using their own instruments in a choral ensemble. Morgan Luttig ’14 conducts the W&L University Singers during Fall Convocation 2018. How did W&L prepare you for your choice of careers? I could not have asked for a more personalized education at Washington and Lee. Professor Shane Lynch helped prepare me for my career in choral music education with individual attention and guidance that has made a world of difference in my teaching. Dr. Lynch brought me in as part of the Choral Conducting Mentorship Program, where he mentored me not only as an educator but as an ensemble conductor. 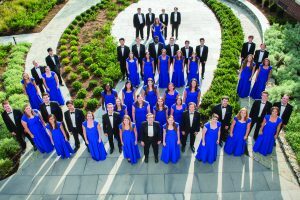 W&L provided me the opportunity to conduct all choral ensembles throughout my time as a student, which is a unique element of the program. 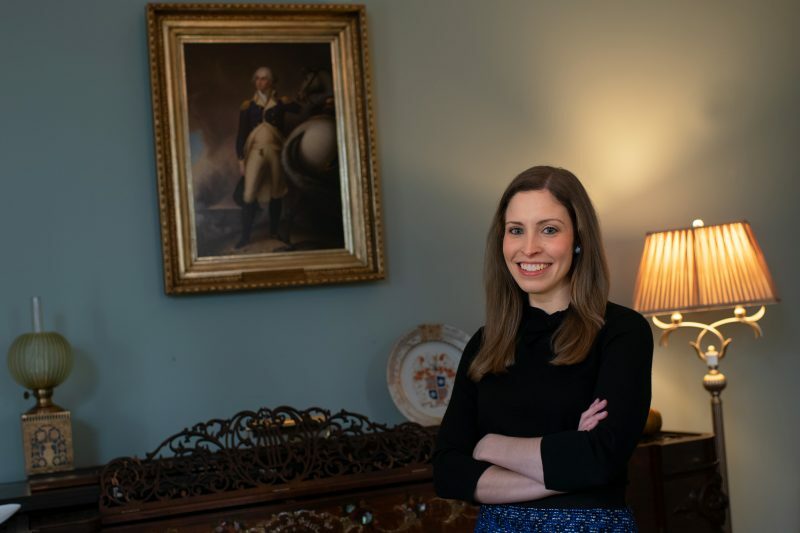 In addition, the teacher education program at W&L, under the guidance of professors Lenna Ojure and Haley Sigler, was instrumental in my future career. Opportunities to student teach and participate in urban education classes, as well as being active in classrooms in Rockbridge County and beyond, were some of the highlights of the W&L education program. Did anyone at W&L serve as a mentor to you when you were a student? If so, who and how? My greatest mentor at W&L was Professor Lynch, the director of choral activities. He took a chance on me when I was a high school student visiting campus, and he spoke with me about the opportunities I could have at W&L as part of the Choral Conducting Mentorship Program. I would not be where I am today without him. He mentored me throughout my time here at W&L, and never lost touch while I was teaching Pre-K-12, and we continued to keep in touch throughout my master’s studies. Now, he and the rest of the music faculty and W&L administration have taken a leap of faith in bringing me back to take his position while he is on sabbatical this year. It is such an honor to be here. I could never replace him and the enormous impact that he’s had on this campus, but I love working with the choirs during my time here! What exciting things are in the works for the groups you are conducting during the remainder of this academic year? We have such an exciting year ahead! We have performed two full-length concerts already, one for Parents and Family Weekend, and the other being our Annual Fall Choral Concert. Coming up, Cantatrici and the Men’s Glee Club will perform alongside the instrumental ensembles at the Holiday Pops Performances on December 3 and 4. The University Singers will perform next for the Annual Candlelight Lessons and Carols Service on December 6. One exciting part of the year is that the University Singers will travel to Scotland in April for an international choir tour. Part of the focus of this year’s choral studies is audience engagement and how we can utilize different pieces, performance techniques and movement to engage audiences of all ages and communities. This focus appears in the international tour program’s four sections—togetherness and separation, prayer and reflection, Scottish Traditions, and American Essences of Home. Each element of the tour set challenges the ensemble, expanding across time periods and styles. 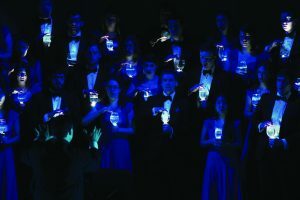 All choral ensembles, including Cantatrici, The Men’s Glee Club, and University Singers will perform at SSA in March, as well as within their own individual concerts during Winter Term. What is it like to stand on the other side of that conductor’s podium? There are no words that could truly describe how strange, amazing and humbling it is to be on the conductor’s podium in front of the W&L choral ensembles. When I stood on the podium as a student conductor during my time here, I never could have imagined being fully in charge of these ensembles as their director. I’m continually blown away by the caliber of students, singers and musicians we have here at Washington and Lee. 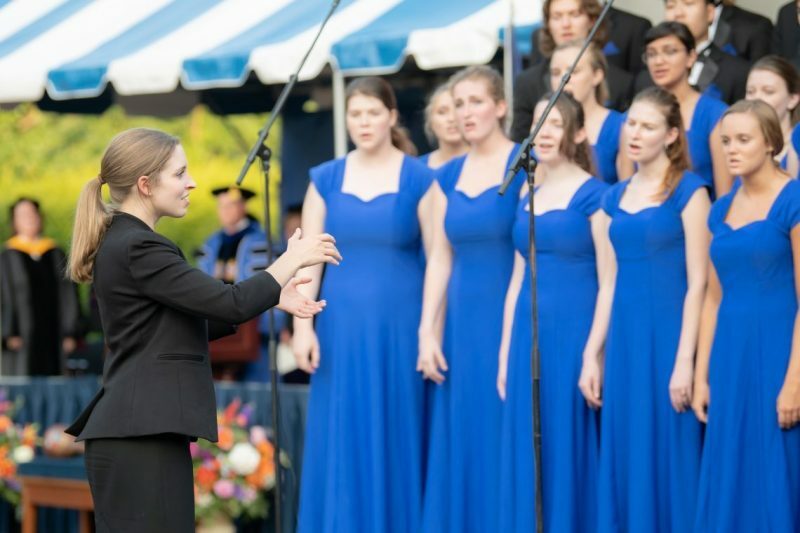 The choral students dedicate so much of themselves to this program, and that is something that Professor Lynch has developed throughout his tenure. From first-years through seniors, these students love choir in a way that is so much stronger even since my time here. It is truly an honor to stand in front of these students. Morgan Luttig ’14 steps comfortably into the role of conductor while Professor Shane Lynch is on sabbatical.